"Isn’t it a joy to study and regularly practice? What’s more, isn’t it a joy to meet comrades from afar? " These are the opening words of the Analects of Confucius, a small collection of sayings by the ancient pioneer of liberal arts education. The "study" Confucius refers to does not only focus on book learning, but rather on social relationships, and not least, the great virtue of "humanity". Learning about "humanity", and trying to realize it in our lives, especially in the company of fellow travellers on the great path or Dao, fills us with a sense of joy. Confucius detests the "proper villager" who unfailingly does the right thing. The problem is that the proper villager does it for the sake of social approbation and not self-cultivation. Instead of "rejoicing in virtue" the "proper villager" steals virtue and uses it as a cloak. 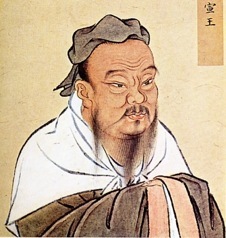 Confucius was perhaps the earliest figure to argue that we have the power to transform ourselves. This was a highly subversive position, especially as he insisted that his followers had the power to become a Chunzi, or Noble Person, a title which originally referred to a son of the aristocracy. For Confucius, it didn’t matter who your parents were. If you did not cultivate your humanity you were not worthy of the title "Noble Person," and not qualified to serve in government.